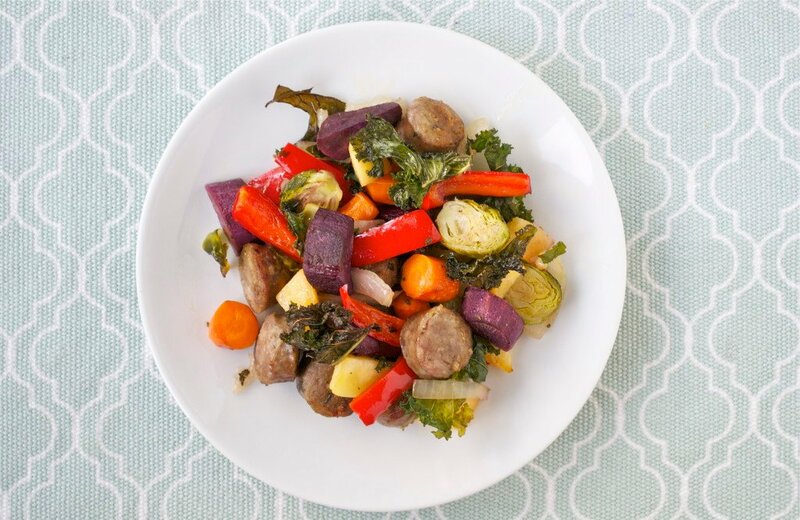 Eat with your eyes with this easy rainbow roasted vegetables and sausage recipe. A one sheet pan meal, it doesn’t get much easier than this! Naturally gluten-free and dairy-free, this is a meal the whole family will love. It’s great for healthy meal prep, too! Filled with colorful vegetables like purple sweet potatoes, rutabaga, kale, bell pepper, and carrots, this easy sheet pan recipe is as delicious as it looks! I’ve been all about the colorful meals lately. The more colors in the rainbow that I can fit in each meal, the better! There’s just something about eating colorful, pretty food that just makes me feel like dancing (No joke, there’s a food happy dance involved). The number of times I have made people look at a purple sweet potato and exclaim “Look how pretty it is!” is almost alarming. Note: I would like to take this time to thank my boyfriend, family, and friends for still talking to me after said purple sweet potato instances. Have you ever noticed how fast food is all kind of brown looking? It’s almost sad to look at. But this meal, oh it’s full of colors and goodness! What more could you ask for? My favorite way to “eat the rainbow” is to chop up a bunch of vegetables and toss with some coconut oil and then roast in the oven for 45 minutes. The combinations are endless! To get you started on your veggie roasting party, I have a recipe for my favorite combination of roasted vegetables and italian sausage for you! It’s so good that I’ve made at least 5 times in the last month alone. Seriously, it’s that good! This roasted vegetables and sausages is as easy as can be and a great way to get more veggies on your plate. Here are a few ways to make sure you make the recipe perfect the first time around! Should I use Precooked Sausage? 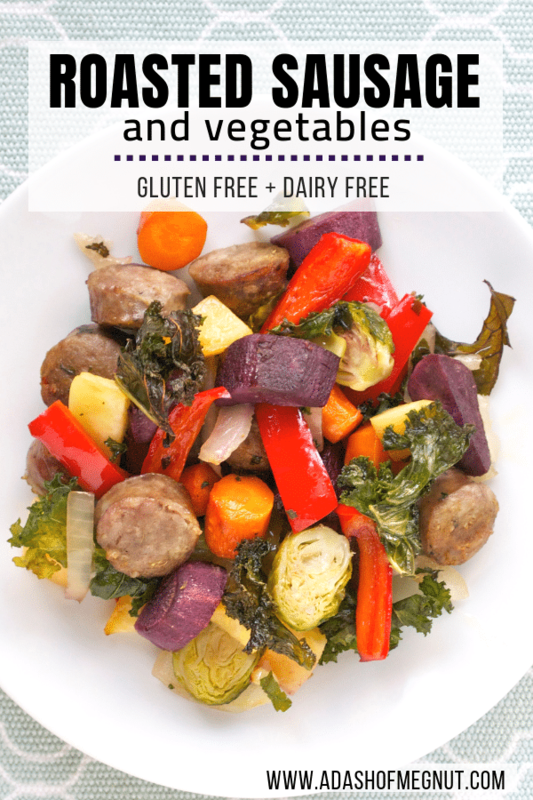 If you want to make this roasted vegetables and sausage recipe as simple as can be, use precooked sausage. If you need to be gluten-free, make sure you check the ingredients to make sure that the sausage is in fact gluten-free. Of course, you can use sausage that is not yet pre-cooked and comes raw. In that case, I would suggest cooking the sausage in the oven or on the stove ahead of time before adding the vegetables. This way, your vegetables will not overcook. Yes! Use whatever vegetables you have on hand. This is a great way to clean out your refrigerator. Other vegetables, such as regular potatoes, squash, parsnips, asparagus, green beans, and even tomatoes work great in this recipe. You’ll want to make sure that you cut vegetables that take longer to cook, such as potatoes or carrots, small enough so that they cook in the same amount of time as faster cooking vegetables, like onions and bell peppers. Try these other Sheet Pan Meals! 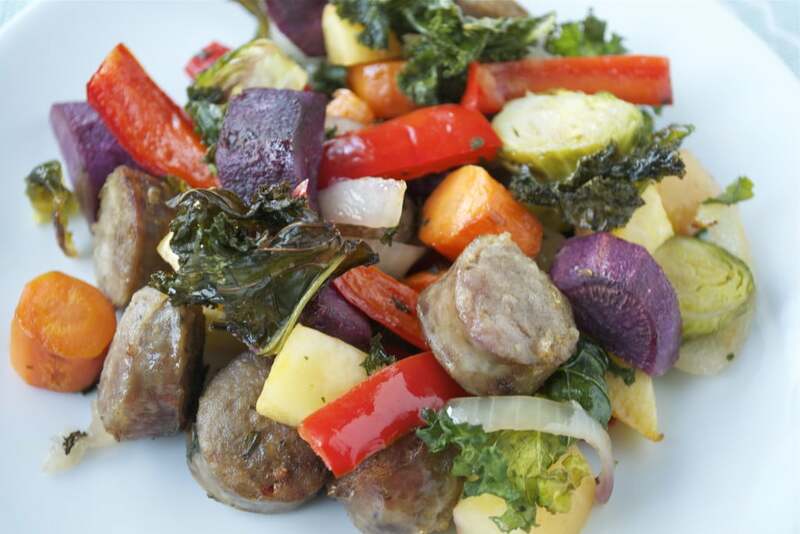 Eat with your eyes with this rainbow roasted vegetables and sausage recipe. A one sheet pan meal, it doesn't get much easier than this! Gluten-free and dairy-free. Preheat oven to 350F. Line a large baking sheet with aluminum foil. Cut all of your vegetables. Place vegetables and cooked sausage in a large mixing bowl. Mix with coconut oil making sure all of the vegetables are covered. Add additional coconut oil if necessary. Spread out sausage and vegetables on your baking sheet so that they are in a single layer. Some overlapping is okay. Sprinkle with salt and pepper before cooking if desired. Bake for 35-45 minutes, mixing every 15 minutes or so, until all of the vegetables are cooked through. You will want to make sure your rutabaga is cut small enough that it cooks in the same amount of time as the other vegetables. Watch to make sure your kale does not burn. You can add it half way through the cook time but I like my kale to get crunchy in this dish. You can also bury the kale under other vegetables to help it not burn.